April 2017 - EPCRA 101: Tips for Successfully Navigating EPCRA Reporting Requirements — Potomac-Hudson Engineering, Inc. Welcome to our second edition of PHE Pulse, a newsletter that we hope you will find interesting and useful in today's every-changing business and regulatory climate. Through PHE Pulse, we hope to provide our clients and colleagues with meaningful information and insights relevant to the environmental profession. The Emergency Planning and Community Right-to-Know Act (EPCRA) requires most federal and industrial/commercial facilities to report information related to their use of hazardous materials. For federal facilities, Executive Order (EO) 12856, Federal Compliance with Right-To-Know Laws and Pollution Prevention Requirements, first established EPCRA reporting requirements, which were later emphasized in EO 13693, Planning for Federal Sustainability in the Next Decade. This article reviews EPCRA reporting requirements, summarizes some of the hazardous materials that are commonly reported and those that are sometimes overlooked, and provides tips and insights to help facilities remain in compliance. Is EPCRA applicable to my facility? Most likely, yes! Any facility that stores hazardous chemicals in quantities that exceed reporting thresholds (more on this later) is required to file Tier II reports. Hazardous chemicals are defined as substances for which a facility must maintain a safety data sheet (SDS) under the OSHA Hazard Communication Standard, which establishes criteria used for identifying hazardous chemicals. Additional reporting requirements may apply to facilities that use certain toxic chemicals (see discussion on Toxic Release Inventory reporting below). Section 312 of EPCRA requires facilities to annually identify all hazardous materials and extremely hazardous substances (EHSs) that exceed established reporting thresholds, and report the maximum quantity stored on site during the year, storage locations, and container types. The reporting threshold is 10,000 pounds for most materials, and 500 pounds (or the threshold planning quantity) for listed EHSs. You can find the reporting thresholds in EPA's List of Lists. Some states have lower reporting thresholds, so be sure to check your state's requirements. Reporting must be completed using the Tier II or state-equivalent form on or before 1 March of each year. What are common hazardous materials reported on Tier II forms and where do you gather your information? Fuels stored in aboveground and underground tanks. Check your facility's Spill Prevention, Control, and Countermeasure (SPCC) plan to estimate onsite fuel storage capacity. Note that each fuel (e.g. diesel, gasoline, or jet fuel) must be reported separately. As a rule of thumb, 1,200 gallons is approximately 10,000 pounds. Sulfuric acid in lead-acid batteries found in uninterruptible power supply systems, electric vehicles, and emergency generators. Sulfuric acid is an EHS with a 500-pound reporting threshold and typically comprises about 20% of the battery weight (refer to the battery SDS, if available, for exact quantities). Facilities storing many lead-acid batteries on site may also need to report lead, which has a 10,000-pound reporting threshold and typically makes up 70% of battery weight. Check with IT, Facilities Maintenance, and Motor Pool personnel to determine the number and size of batteries. Chlorine gas and other chemicals used for water treatment. Other common treatment chemicals include sodium hypochlorite and sodium metabisulfite. Antifreeze and Petroleum, Oil, and Lubricants (POLs) associated with vehicle maintenance (e.g., used oil). 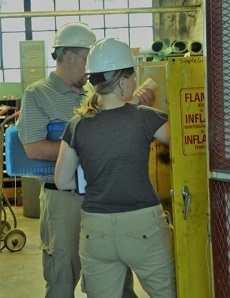 Facilities with industrial activities may be required to report other hazardous materials as well. Check hazardous material inventory reports, if available, and applicable SDSs to identify any reportable hazardous materials at your facility. In addition to the data sources mentioned above, facility walk-throughs are valuable for verifying data obtained from other sources and identify any hazardous materials that were not captured elsewhere. What types of products are exempt from Tier II reporting? There are several categories of products that are exempt from Tier II Reporting, although they may not be exempt from other EPCRA reporting requirements. Common Tier II exemptions are listed below. Products that are packaged for distribution and use by the general public are not required to be reported. This exemption typically applies to products such as batteries (car batteries and smaller), paints (typically 5-gallon containers and smaller), lubricants, coolants, insecticides, fire extinguishers, and cleaning compounds. When these types of products are stored in bulk containers, such as 55-gallon drums, they no longer qualify for the exemption. Substances present as a solid manufactured article, such that exposure to the substance does not occur under conditions of normal use, are exempted from Tier II reporting. This exemption typically applies to small arms ammunition, sealed capacitors, and dry-cell batteries. Chemicals that are used at a research laboratory or medical facility are exempt from Tier II reporting requirements. This typically includes compressed gases used for medical purposes and hazardous chemicals that support medical/laboratory research and diagnosis. Hazardous waste regulated under the Resource Conservation and Recovery Act (RCRA) is exempt from Tier II reporting requirements. This includes waste stored at 90-day storage sites and satellite accumulation points. Note that used oil or used antifreeze that will be recycled is not considered a hazardous waste and does not meet this exemption. What is Toxics Release Inventory (aka TRI or Form R) Reporting? Section 313 of EPCRA requires some facilities to report the quantities of listed toxic chemicals that are released to air, land, or water, or are shipped off site for disposal, treatment, or recycling. TRI reporting applies to federal facilities and to commercial/industrial facilities that fall within specific North American Industry Classification System, or NAICS, codes. Facilities that use any listed toxic chemical or chemical category in amounts exceeding the reporting threshold must report releases and offsite transfers of the chemical. For facilities that do not manufacture or process chemicals, the 10,000-pound "otherwise-used threshold" is most commonly applicable. Reporting thresholds are significantly lower for certain persistent, bioaccumulative, and toxic (PBT) chemicals (either 10 or 100 pounds for most PBTs; 0.1 grams for dioxins). TRI reports are due 1 July each year. What are some chemicals commonly reported under TRI (Form R) and where do you gather your information? Benzene, xylenes, and other constituents of fuel are commonly reported by facilities that dispense significant quantities of fuel (such as airfields). Check with Facilities Maintenance or other personnel responsible for tracking fuel use. You can estimate concentrations of these constituents using EPA's guidance (see Table 3-4). Nitrates produced as by-product of wastewater treatment are often reported by facilities with wastewater treatment plants (WWTP). Check WWTP flow data, wastewater sampling and analysis records, and WWTP sludge disposal records. Copper and lead are common munitions constituents and are often reported by military installations and other facilities with small-arms ranges. Check munitions usage records, hazardous waste manifests, and non-hazardous waste shipment records. Facilities with industrial activities may be required to report other toxic chemicals as well. Check hazardous material usage reports, if available, or material purchasing records and applicable SDSs to identify toxic chemicals that need to be reported. As with Tier II reporting, facility walk-throughs are a valuable tool for verifying data from other sources and identify any toxic chemicals at your facility that were not captured elsewhere. What types of products are typically exempted from TRI reporting? Chemicals intended for personal use are not required to be reported. This exemption typically applies to chemicals present in products used by employees for personal comfort. Chemicals used for routine janitorial or grounds maintenance are exempt from TRI reporting requirements. Chemicals used to maintain motor vehicles operated by the facility are exempt from reporting requirements. This exemption does not apply to motor vehicles that are brought on site solely for purposes of repair or refueling. For example, depot-level maintenance activities at military installations are not included within this exemption. Chemicals present in solid manufactured articles, such that releases of the chemical do not occur under conditions of normal use, are exempt from TRI reporting. Chemicals used at a research laboratory facility are exempt from TRI reporting requirements. This includes chemicals that support medical/laboratory research and diagnosis. Chemicals present below de minimis concentrations are exempt from TRI reporting requirements. The de minimis level for most toxic chemicals is 1%. This exemption does not apply to PBT chemicals. Are there any other reporting requirements under EPCRA? Yes! Sections 302, 304, and 311 each have reporting requirements. Section 302 requires all facilities to provide a list of all EHSs stored on site in amounts exceeding the applicable threshold planning quantity. Notification under Section 302 must be made in writing within 30 days of any change that affects reporting of EHSs. Section 304 requires all facilities to report, verbally and in writing, any spills of EHSs and certain other hazardous substances if the amount spilled over a 24-hour period exceeds the reportable quantity. Section 311 requires all facilities to submit a one-time list (or provide copies of SDSs) of all hazardous materials stored on site in quantities exceeding 10,000 pounds or the applicable EHS threshold, with updates as needed. What are some common EPCRA regulatory violations? Inaccurately reporting chemicals, such as combining two separate chemicals on a single form. For example, two different fuels or POLs stored in adjacent tanks may be inadvertently reported as one chemical. Inadequate documentation to support a decision not to report. Documentation should include all applicable data on hazardous materials quantities and any assumptions and calculations used. Not filing Section 311 updates. Although Section 311 requires a one-time submission, it also requires that updates be filed to account for new chemicals or increases in the amount of a chemical present at the facility. Failing to report all chemicals that exceed applicable Tier II or TRI thresholds. For example, sulfuric acid is an EHS and has a Tier II reporting threshold of only 500 pounds, but is often omitted from Tier II reports when it should be included. Late reporting. Tier II reports are due by 1 March each year, while TRI reports are due by 1 July. What are the benefits of EPCRA Compliance? The most obvious benefit is achieving compliance with regulatory requirements and avoiding expensive fines. In 2016, the grocery chain Whole Foods Market was fined over $36,000 for failing to report the storage of sulfuric acid, lead, and diesel in a timely manner. There are other benefits as well. Many organizations have established sustainability goals, and accurate and complete EPCRA reporting can provide valuable data to track progress towards these goals. A review of Tier II and TRI data can also yield valuable insights about where to focus toxic chemical and waste reduction efforts. If you have any questions or comments regarding this article or recommendations for topics to be addressed in future articles, please feel free to contact John Ribar (619.260.1033 ext. 301, johnr@phe.com) or Brian Whipple (301.907.9078 ext. 3029, brianw@phe.com).